Pour each of the gelatin dessert mixes into a heat safe bowl and set aside. Pour the water into a medium saucepan. Sprinkle with the 6 envelopes of plain gelatin. Allow to soak for a minute or two. Heat over medium low heat, stirring constantly, until the gelatin is fully dissolved (about 5 minutes). Pour one cup of the plain gelatin mixture into the bowl containing the strawberry gelatin mix. Stir for two minutes, or until the red gelatin is dissolved. Repeat process with the blue gelatin. Add one cup of the liquor to each bowl, stir well. Pour the sweetened condensed milk into the saucepan containing the rest of the clear gelatin mixture. Add 1/2 cup of the liquor and stir well to combine. Lightly spray 4 1 lb loaf pans (about 8 x 5) with cooking spray. Wipe out with a paper towel. Pour 3/4 cup of the red gelatin mixture into one of the prepared loaf pans. Repeat with 3/4 cup of the blue gelatin mixture. Divide the white gelatin between the remaining two pans. Place all the pans in refrigerator until the gelatin is set (at least an hour). Cover the liquid gelatins and set aside. When the pans of gelatin have set, dice the gelatin into small cubes. (You can cut the gelatin right in the pan). Grab the liquid gelatin (if it is starting to set up, microwave for 10 to 15 seconds - just long enough to soften, not warm the gelatin - and stir thoroughly). 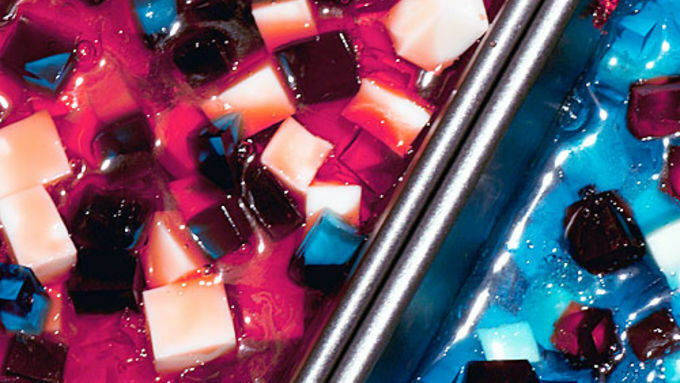 Pour the liquid gelatin, red in one pan, and blue in the other, to fill about 3/4 of the way up the gelatin cubes. (You may have a little liquid gelatin left over.) Return pans to refrigerator and allow to set for several hours or overnight. Remove pans from the fridge. 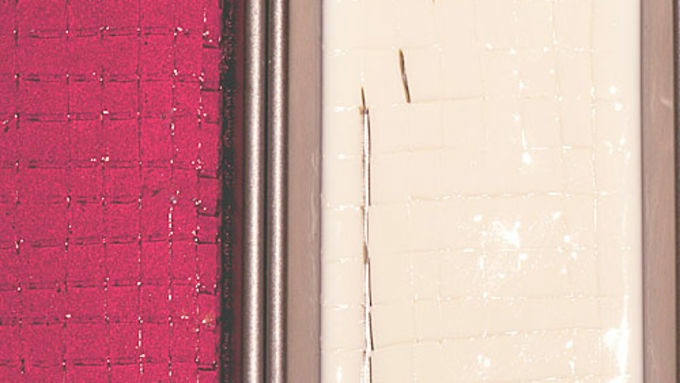 Cut around the edges of the pan, and invert the gelatin slabs onto a non-stick surface for cutting. Cut the gelatin into 3/4 to 1 inch strips, wiggling your knife to give an uneven edge (like rock candy). If you cut the strips too thin, they will break when skewered. 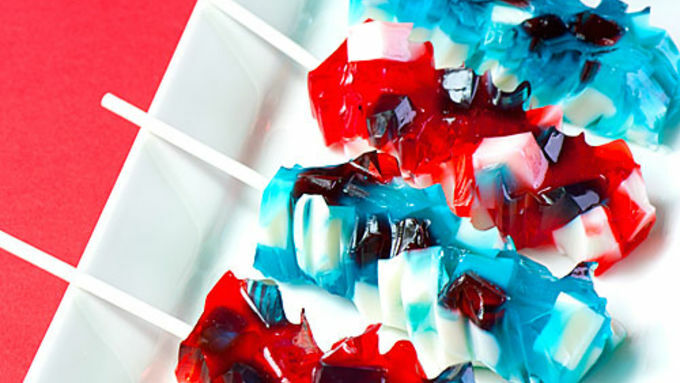 Skewer each strip with a lollipop stick - hold the gelatin gently at the sides, and insert the stick almost all the way to the top. Place on a non-stick cookie sheet and chill until ready to serve! Cocktail on a stick? You better believe it! It’s no secret that we Minnesotans take our “stick food” very seriously (it’s an official obsession, per the Minnesota State Fair Wikipedia page!). As such, it’s no surprise that I’ve been utterly possessed by these “rock candy” effect gelatin cocktails for some time – ever since I first saw them on the wonderful Baker Royale blog, which featured a dazzling Midori Sour version. The nubby rock candy effect is achieved by setting and dicing part of the gelatin, then binding it with more liquid gelatin– ingenious! 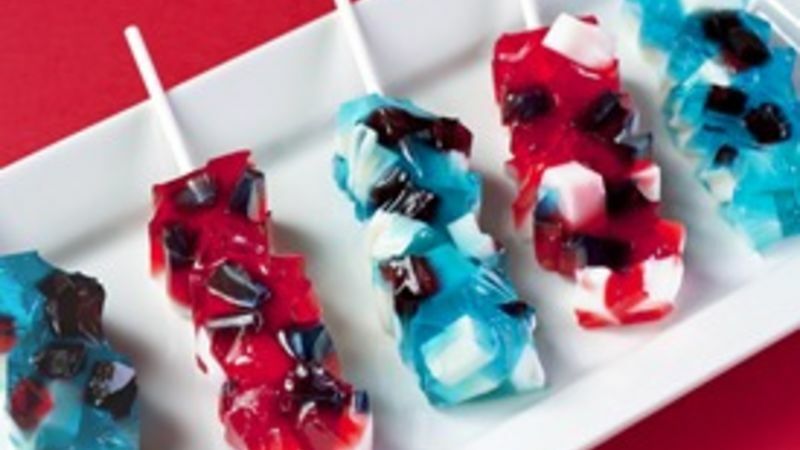 With the 4th of July at hand, entertaining on the calendar, and guests to dazzle, what better time to give Rock Candy Jelly Shooters a patriotic whirl! The recipe is easy, but does take a little time to put together. Also, because the gelatin is diced, and then combined, it is much easier to handle if it is able to set and fully bond overnight. Start a batch after dinner the night before your party. Although the recipe below is an adult version, spiked with flavored rum or vodka, a kid-friendly version can be made by substituting lemon-lime soda (or even just additional water) in place of the alcohol. Happy Fourth of July!